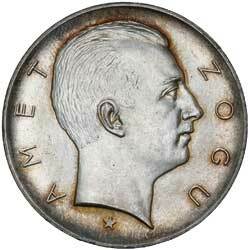 ALBANIA, Kingdom, Zog I, silver five franga ari, 1926 (KM.8.2). Attractive peripheral tone, choice uncirculated. ALBANIA, Kingdom, Zog I, one franga ari, 1927 (KM.6). Toned, uncirculated. 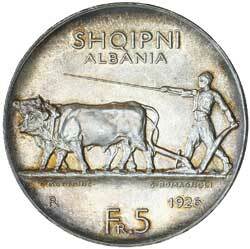 ALBANIA, Kingdom, Zog I, silver five franga ari, 1926 (KM.8.2). Choice uncirculated.